This is another one of those dishes that makes good use of late summer/early fall produce while still feeling cozily satisfying when the days cool off. My local supermarket just wrapped up their annual Hatch chile extravapalooza or whatever, so I used them to make the pesto, but I think poblanos or Anaheim chiles would be equally delicious. That little smattering of chile pesto floating in the soup looks pretty, but if I’m honest I added another tablespoon of the stuff before I ate it. I’ve also discovered that this pesto is awesome on eggs…and sandwiches. It’s just snappy enough to be interesting without being totally mean heat-wise. I’m thinking of making a massive batch with the last of the summer’s crop to see me through the winter. 1. Sauté diced onion in olive oil in a medium-sized soup pot over medium heat until onions are translucent. Add diced potatoes and cover with chicken broth (about 1 1/2 cans, but just use enough to cover the potatoes). Simmer over medium-low heat until potatoes are cooked through. 2. 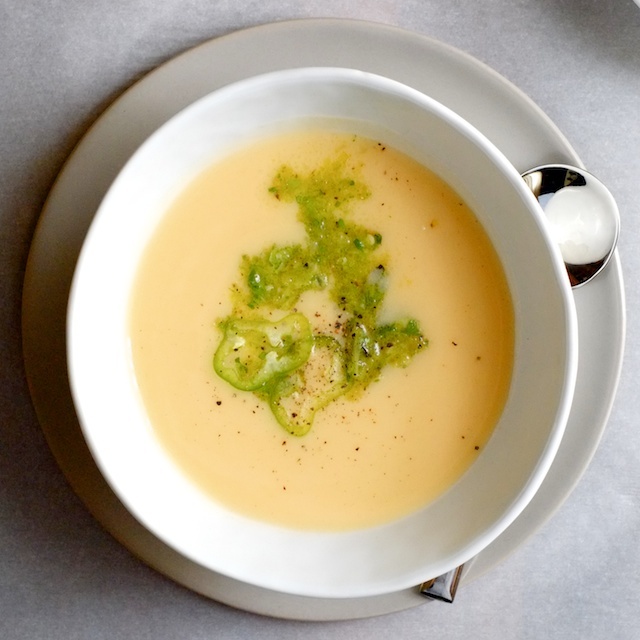 Use an immersion blender to puree cooked potatoes and onions in broth. Add more broth if the mixture is too thick (it probably will be). 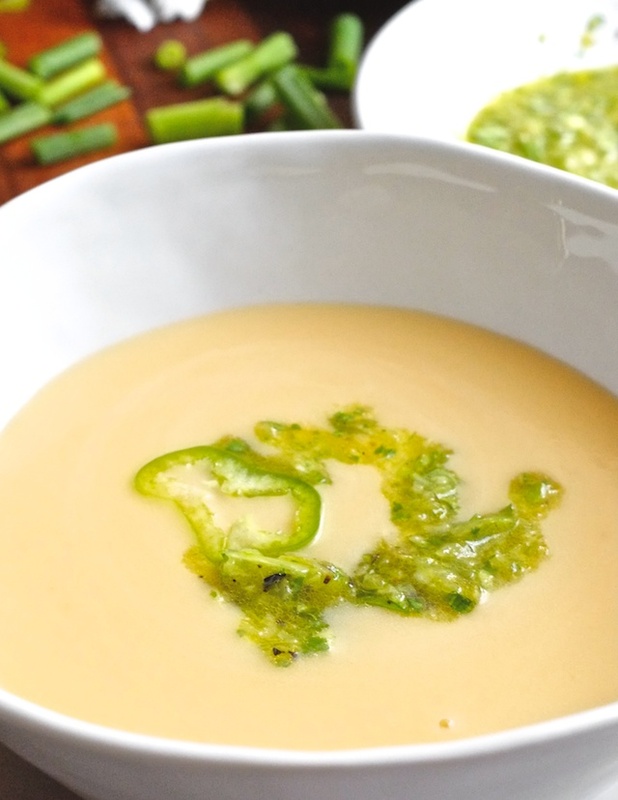 Remove soup from heat and stir in sour cream and cheese until the mixture is smooth and the cheese is melted. Taste and add salt and pepper to your liking. 3. Char whole green chiles over a gas burner, on a grill, or under the broiler until they are blackened in spots and somewhat softened. Remove seeds and stems from charred peppers. 5. 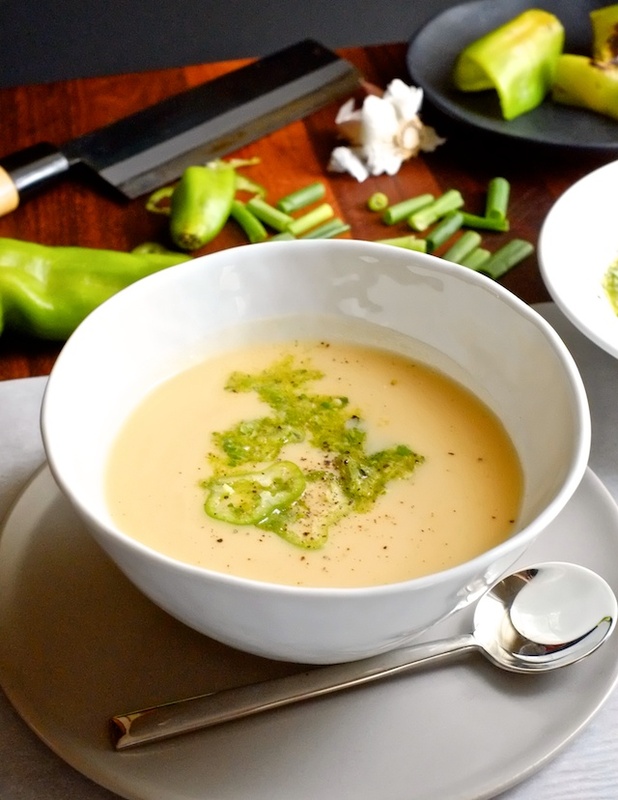 Serve soup by pouring potato cheese soup into bowls and topping with pesto and maybe some black pepper. Crusty bread is recommended. Add salad to make it a meal.